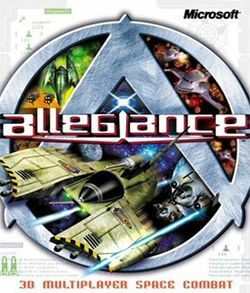 Allegiance is a multiplayer online game providing a mix of real-time strategy and player piloted space combat gameplay. Initially developed by Microsoft Research, the game was later released under a shared source license. The Allegiance community is unlike many others in that it actively promotes newbie training. They have many training programs and strategy guides that they run on their own site and continuously update. See External links for more information. Players pilot spacecraft (from small one-man vessels to large capital ships), flying in a team with other players and trying to gain victory through various means, such as destroying or capturing all enemy bases, or eliminating the enemy's will to fight. Teams are led by a single Commander who makes tactical decisions and invests in technology and bases. Flight and combat is done in either a first or third person view in a 3D environment, with a real-time, top-down "Command View" of your immediate surroundings also available. Flying a ship is unlike other space sims as Allegiance uses a non-Newtonian flight model. It is unlike air combat sims too, as drag is diminished and inertia plays a greater role in how ships handle. In fact, the ships handle as if the entire game were set underwater, not in space. Although this makes the game unrealistic it maintains game balance, and the furious up close and personal dogfighting which typifies first-person shooters. This page was last edited on 27 August 2016, at 02:01. This page has been accessed 6,101 times.